The idea behind this page is to provide a means where people can attempt to make contact with others interested in researching the same lines, the same related topics. Perhaps here a missing link that you are wondering about could be found from the files of another interested researcher. Perhaps a more “in your face” way of asking questions of people than the up to now more typical Massive emailing to F/F/F Mailing Members. Please think of a clear subject line … and please provide good contact information (valid email address at the minimum). Again, this is a page in progress and will be fine tuned the more it is contemplated and utilized. Similar types of efforts to “reach out” can also be done on the associated Facebook Page by pressing this link. Please also make the SUBJECT of your Request clear. We believe Albert (1.1.1) married married Emma M. Robertson – but we can’t find a record to prove this. They had Beulah Louise Flora (born June 1887). We know from Beulah that Albert died in a train accident when she was two. She lived with her grandparents in Paw Paw while her mother worked in Cumberland. Cant find a birth record for Beulah, nor a marriage record for Albert and Emma. Beulah married Joseph Crisp and they had Flora May Crisp. 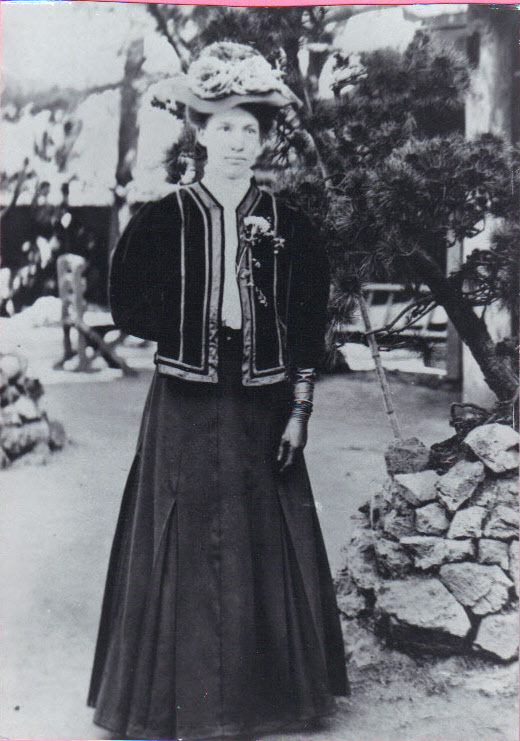 Flora May married Edward Davis Rowse and they had four boys, including my husband Thomas. Judy Fehringer has the following line of Inquiry she is trying to pin down. Judy writes “I am trying to find more information on a John Flora. I will try to line out as much information as I have [on him]. In “ An Illustrated History of Los Angeles County, California” originally published by the Lewis Publishing Company, Chicago, 1889, we find a story of my 2xgreat grandfather, A.W.Flora. It states: “A.W.Flora, deceased, was born in Loraine County Ohio, in 1831, his parents being John and Alvira (Mellen) Flora, natives, respectively, of Pennsylvania and New York. The father was drowned when the subject of this sketch was eight years old. His mother married again and moved to Illinois and subsequently to Wisconsin.” That is the information I had to start my quest. I have found a John Flora living in Brownhelm, Lorain County, Ohio in 1830, listed as a single man of 30 years but not 40 years old. Then I found a marriage license for John Flora and Alvira Mellen on 23 June, 1830 in Lorain County, Ohio. Their son, Andrew Washington Flora (my 2xgreat grandfather) was born 30 Apr 1831 in Lorain County, Ohio. John Flora died 4 May 1839, and his tombstone reads “drowned in the Black River”. He is buried in the Pioneer Cemetery, South Amherst, Lorain County, Ohio. In the 1840 Federal Census, we find Alvira Flora listed as head of household age 20-29 years old, in Amherst, Lorain County, Ohio with 2 males under the age of 5, and 3 males age 5-9. In the 1850 Federal Census we find Nashington (which is certainly a transcription error for Washington; I think that my GGgrandfather went by the name “Washington” as a young man) Flory listed in the household of Asa Patten, whose wife is Almira Patten, in Pulaski,Wisconsin . We also find a Richard Florey living in the household of Lemora (?) Mellen, in Pulaski, Wisconsin. In the same census, just a few lines up in the census listing from Asa Patten.I have a marriage for Washington W Flord and Hellen S. Kendall on 16 May, 1866 in Pulaski, Wisconsin. A few spelling errors notwithstanding, that is the marriage for my GGgrandparents. Still trying to find more information, I kept looking for any Flora males born in Ohio and living in the Pulaski Wisconsin area. I then came up with Commodore Peary Flora, born in Lorain County, Ohio about 1835, marrying a Mary P Higgins 18 Oct 1857 in Pulaski, Wisconsin. The marriage index lists the parents of Commodore as John Flora and Clara. Could the name Clara be a misreading of Alvira? In the 1880 Federal Census we find Commodore Flora living in Willow, Wisconsin with wife Mary and children including a daughter named Alvira. In the 1880 Federal Census,I find Richard Flora, born in Ohio about 1837, living in Pulaski, Wisconsin with wife Julia and children including a daughter Elvira and a son Andrew. Asa and Alvira Patten lived in Pulaski, Wisconsin and then moved in their later years to live in Hammonton, New Jersey, where they both died. On various legal forms I have seen Alvira’s name also spelled Elvira, Almira, Almyra, Elmira and Almer. If this is the mother of my Andrew Washington Flora, Commodore and Richard, why did they go live in New Jersey instead of staying in Wisconsin? I believe that they lived with adopted children, but why not with her natural children? I know I am making some leaps of faith here. When John Flora died, Alvira was left with a number of small children. I am guessing that she went to live with family and possibly farmed out her children to live with other family members, or they hired out as hired hands fairly young. I think that my Andrew Washington lived with his mother. Richard Florey is living with a Mellen (same surname as his mother’s maiden name, so a relative?) in 1850. I haven’t found Commodore Flora in 1850, but there could be a spelling error, so that I can’t find him. I think that Alvira Patten is the mother of Andrew Washington Flora, Commodore Peary Flora and Richard M. Flora (could the M in his name be for Mellen?). I have found no hint of where the other two young males in the original household in 1840 have gone. We find Andrew, Commodore and Richard using Alvira/Elvira as first or second names for their daughters. I am not too concerned with the different spellings of Alvira/Elvira/Almira etc. as whoever wrote the name may have spelled it how they thought it should be spelled. I am also not too concerned with the Flora/Florey even Flord spellings, as again, it depends on who was doing the writing or who was trying to read the writing. There is also an Almira/Elmira Sturtevant living in Pulaski, Wisconsin, who is about the right age of my Almira, so she is another possibility for being the mother of these three men. I am discounting her mainly because there was not a Flora/Florey living with her. On one Flora family forum, just today, saw a Susan P (with a mindspring email address) who had made the connection with Commodore and Richard, but her email address was from 2001 and it bounced back to me. If anyone knows who she is, I would like to get in contact with her. On most of the census forms, I have found my John Flora listed as being born in Pennsylvania, but I have no other information on him. I guess him to be born 1790-1800 if the 1830 census is correct. I have come to a complete standstill in my search any further for both John Flora and Alvira Mellen. Any hints or help would be appreciated. “I have made a breakthrough on my Flora line, but it is for the mother of Andrew Flora. I have been busy trying to pin down all the information so I can prove what I have found. I had been following the family of Asa and Almira Patten, thinking that Almira was the mother of the Flora boys, because they were the family that my Andrew W Flora was living with in 1850. I had looked briefly at an Alvira Sturdevant, but had discounted her mainly because there was no Flora living with her. However, I had revisited her for a number of reasons and I thought she was a much stronger candidate. I started to seriously think that she was the mother of Andrew Washington Flora, Commodore and Richard. Then I recently visited with my aunt in California, and she had copies of a bible and I don’t think she knew what she had. (When I visited her, I did the “grab and copy” method of genealogy research. That’s when you make copies of everything you can get your hands on without reading it, because you don’t know if you will ever have access to the information again) Her copies of that bible showed an entry for a marriage for John Flora and Elvira, as well as an entry for Elvira and Marcus Sturdevant. Plus the names and birthdates of Elvira’s parents and death dates for three of her four grandparents. I am not sure of the relationships of several of the people, but I think by the way they are listed that I can follow the family generations. Then when I started looking on Ancestry.com, I found that Elvira named her son from her second marriage, Marcus Commodore Sturdevant. What a coincidence. I contacted someone who was working on the Sturdevant line, and their family story was that Marcus Sturdevant Sr. left Ohio and went to Wisconsin with Richard Flora to get land. That was the final straw to make me think there definitely was a connection, although the lady I wrote to, had no idea that there was a blood relationship between the Sturdevants and Floras. “To top it off, I also visited the grave of Andrew W Flora in Georgetown, Calif, and in the same plot he is, was a headstone marked “J J F”. They were buried in the Oddfellows part of the cemetery, and when I contacted a representative of the Oddfellows, he said that their records showed that it was a John J Flora ( but he didn’t have immediate access to the original records. When I asked him if anyone could get to the records he just laughed) . In the census, Andrew W Flora, his wife and child, plus a “John Jackson” were all living in the same household. In the probate records for A W Flora, his widow deeded some land to a John Jackson Flora. To me, if someone with the same last name was living in the same house, you had land dealings with him and he is buried in the same plot, there is a close family relationship. When I mentioned something to my aunt, she said that she was pretty sure he was Andrew’s brother. So now, I think I have 4 of the 5 brothers listed in the 1840 census: Andrew Washington Flora, John Jackson Flora, Commodore Peary Flora and Richard M Flora. I personally would love to find out what Richard’s middle name is; somebody famous?? “From what I have seen, John J Flora had no children, although it is possible in his later years. He has been hard to track down. Judy’s email can be immediately provided if anyone thinks that they may be able to help her with this. The following is received from Jon Florey who is trying to add more to his knowledge of the various physical movements as well as religious trends in the family ….. I now know that the Floreys were Lutherans 350 years ago. As a child I was told that my parents went ‘church shopping’ and just happened to pick the Lutheran Church-Missouri Synod. That seems a little coincidental and I wonder if most of the other Florey — Flory — Flora family members are also Lutheran or have been Lutheran recently. I see that the family was Lutheran in Revolutionary War times. Were they still Lutheran in Macon County, Illinois? Why did William Franklin Florey leave Illinois? Why did he settle in San Jose, California? He was a farmer, but what did he grow? Did he own a farm? Where was it? What happened to it? George Morgan Florey, my grandfather, was a piano and organ tuner who worked for Bruenn Piano in San Francisco. He joined that company at about the same time Gustav Heine did. Heine became a partner and then fought a duel with Bruenn. He won and took over the business. He was also an early Ford dealer and tried to manufacture his own luxury car. It looks like my grandfather went into business for himself rather than work for Heine. Ms. Farley would “genuinely appreciate any information you might have on this subject (or advice to keep on searching elsewhere)”. Hello, Vanessa … here’s hoping that someone has some information to give you on this topic. Regarding your questioning whether one woman could give birth to twenty children in thirty years, it would seem that it was not uncommon for women (especially before 1900) to remain pregnant throughout their fertile years. That is one reason so many women died young. So, really twenty in thirty years wouldn’t be that amazing. (In my line’s case, it would seem Nicholas Adolph Flohri’s second wife had seventeen children in what would not have been a dissimilar period of time. Have you also posted your query on the Facebook page as well? Looking for anyone researching Joseph Jakob to Johannes Flory’s line. My family who stayed in Rapho Township, PA for many generations. They began German Baptist Brethren to a union Church (Salem Church of Kissel Hill) to the Moravian Church. I am trying to find out what generation belonged to which church? Also, Johannes had 20 children with 1 wife? Why is no one discussing the fact he might have had more than 1 wife? It’s pretty improbable 1 woman was able to birth 20 children in a 30 year span. Have received the following query from Michael Baumgartner in Basel, Switzerland regarding a FLURY resident in London in the 1940s and 1950s. If anyone can help him with his quest, it would be appreciated. (1698-1744) violins since over 35years. Can you identify the person mentioned as “Monsieur E. Flury, Woodside Gardens, Tottenham” in the following documents [Note: Documents that can’t be inserted at this point]? I would highly appreciate any information about this person who must have own the violin from 1949-1951. Hi all and thanks for having this page. Having a hard time locating my husbands grandmothers side of the family. They were John and Katherine Flora. One child that I know of ( husbands grandmother) was born Cora Ezrietta Flora but later changed her name to Jayne or Jeannie. She was born Aug 1st 1914 in Indiana. I found the info on her parents names in an obit. Any help would be appreciated. Here’s hoping that someone following this blog might come up with some information to help you. My family does not seem to have any Indiana connections that I know of (Pennsylvania, Virginia, Kentucky and Illinois). Regards, S.
Thanks for the quick answer. I have been driving myself crazy for a long time trying to figure out this part of his family. I am not sure how often this is checked or updated, I am the 4th great grandson of Robert F. Mitchell and have recently acquired tons of History and actual original photos of the Mitchell/Flora family. not really sure how or where to share it. please message me if you want or are interested in the info. Hello. Always interested in such information. Can you look at the various lines of the Flora family posted on this site and make any determination as to which one your Mitchell/Flora line connects to? I am making a guess that it is basically an American focused connection? If so, do you have ideas regarding which American state/s are the main focus? One can never know where new information might lead …. and if I can get a bit more from you regarding the archives you have, we can think about posting it on the site in an appropriate page. 1) I see that Daniel and Brian Flora submitted information on William Butler Flora to the wordpress site. I’d start by tracing the information back to the most recent mention and ask for documentation. So email Daniel Flora and Brian Flora and ask for more, better information. 2) Order WBF’s CW papers from the NARA and see if it is in that material. c) go to a local FamilySeachCenter and ask if a copy is in the LDS Salt Lake City vault. d) figure out which IL library you need and call them. I am researching the 37th Kentucky Infantry. I found this site looking for information on the unit. William B. Flora was a member of the regiment during the Civil War. I am interested in obtaining a copy of the “Personal War Sketch” he wrote for his GAR Camp at Paxton, Il. Hi …. I’ve approved your comment. Hopefully someone might be able to help you with the research item you are seeking. I suppose you saw the entry for William B. Flora on the page https://flohri1754.wordpress.com/civil-war-american/fffs-who-served-in-kentucky-units/ ? Actually I think that Daniel Flora might be able to help you on that quest …. I believe that he is the one who provided the other information and photos regarding W.B. Flora for the site …. I am trying to find information on Barton Burdell Metzler. Son of Daniel Metzler and Samantha Flora. He was born 1880 in Clear Creek In. and died 1899 in Montpelier, In. I am trying to find the cause of death. Also was he a United Brethren? Thanks for that post, Donna …. I have also posted your query on the Facebook page associated with this WordPress site. Here’s hoping that someone has something to aid your search. Regards, S.
Now Tennessee Floras are new to me, and I have none showing up in my tree so far (though many are next door just in Kentucky). Does anyone have anything that seems to connect? If so, please let me know and I will get the two of you in touch. I found Alvira’s family, with the help of some copies of bible pages that my aunt had. I didn’t even know they existed, and I have been working on this for a long time. Alvira is the daughter of Samuel K Mellen and Lemira Finney. In my searchings through census forms, I had found Lemira, living in Pulaski, WI with Richard Florey. Richard would be her grandson. In the 1840 census, Alvira is listed with 5 boys under the age of 10. I think I have now found 4 of them. There is my GGgrandfather, Andrew Washington Flora, b 1831; John Jackson Flora, b say 1832; Commodore Peary Flora born say 1835 and Richard M Flora, born say 1837. I suspect that the fifth child died, because I have found no trace of him. I had found Samuel K Mellen’s grave in Lorain County, Ohio, buried in the same cemetery as John Flora. The transcription of the headstone had his age and date of death making him too young to be Alvira’s father, however I had someone read the headstone and the transcription was incorrect. The bible verified the death date, so I had indeed found Alvira’s father. Lemira is descended from the “Bristol Finneys” and I was able to take her line back quite a ways. I have found some other documents that support my belief that Andrew, Commodore and Richard are brothers. Mostly they are marriage records for the men, who list parent’s names. After the death of John Flora in 1839, Alvira married again in 1841. She married Marcus Sturdevant and they moved from Ohio to Illinois and ended up in Wisconsin and had another 5 children. I have been in contact with a descendant of a son from this second marriage whose family narrative is that Marcus Sturdevant and Richard Flora moved to Wisconsin to find land, but she had no idea who Richard Flora was. Now I need to find John Flora. The only thing I know about him is that the 1830 census listed him as between 30 and 39 years of age. My family’s story says that he was a native of Pennsylvania. If he was between 30 and 39 in 1830, that would put his date of birth between 1790 and 1800. I have been going through all the information on the Flora etc site and I have found a candidate. I am looking seriously at John Flora, son of John Florey ( 1760-1850) son of Nicholas Adolph Flohri. My reasons are: he is the right age; he is not listed with a death date or a wife; and his father was living in Illinois. Remember my family narrative that says that Alvira Mellen Flora married again and moved from Ohio to Illinois to Wisconsin? I have wondered why the family moved to Illinois, but maybe they needed a place to stay for a while before they moved again. And in tracing the birth places of Alvira’s children from her second marriage, the first child was born in Ohio, the second in Illinois and the rest in Wisconsin. I know it is all circumstantial, but it sure does fit. I have a question, and that is how do I find out if this is the right Flora family and this is indeed the correct John. I have found no wills to help me out. Any ideas? I will start working on some collateral lines to see if there are some clues there. However, I thought this all dead ended before and I was able to figure it out. I have my fingers crossed here, too. The John Jackson Flora that I mentioned is an interesting person. 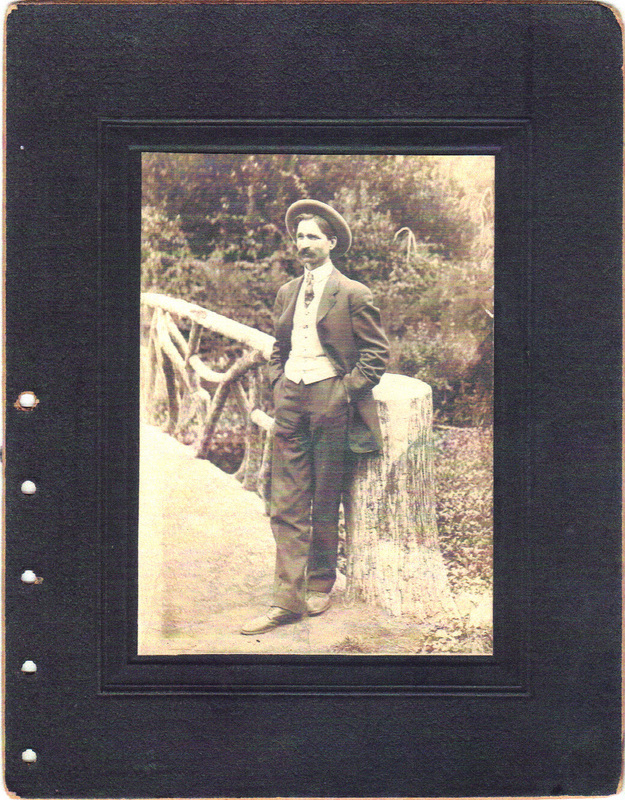 I had found him on a census living with Andrew Flora and his wife in the gold country in California. ( However, he is just listed as John Jackson, not John Jackson Flora). I was out there in March and found that John Jackson Flora took inventory after Andrew died; owned property with Andrew; lived with him for at least a while, and is buried in the same plot. The headstone only has his initials J J F, but he is buried in the Oddfellows portion of the cemetery and they have him listed as John J Flora. I don’t think he married or had children, at least what I can find. After I excitedly told my Aunt about John Jackson, she said ” Oh, I think he is Andrew’s brother”. If you have any suggestions on how to track down my John, or know of someone researching that line of the family, please let me know. If anyone has anything to add on this topic, Judy’s email can be provided. Or, post it on this page and I will pass it to her. I too am looking for the ancestors of John Flora, and if Elvira Mellen’s Richard M Flora is the same that begot Joseph Richard Flora. Joseph Richard Flora & Florence Bill ‘s son John Elmer Flora & Hazel Isabelle Hutchins had my grandfather Robert John Flora who married Rosella Jane Aide. Any help or pointers would be appreciated, new to the geneaology game. “Thanks for bringing this to my attention. Unfortunately, I don’t do Facebook. I hate to make you the go-between, but is there a way you can contact Aaron and tell him to look at the Shade Family tree on Ancestry (jasf1) and contact me through their contact system? I would be more than happy to visit with him, but can’t without some contact info. Yes, the Sturdevants have John Flora on their tree, which is the information they got from me. We are, however, not sure if Elvira is the mother of all the Sturdevant children. From the work that I have done,I am almost positive that Richard M Flora is the son of John Flora and Elivira Mellen, but I am excited if that family can corroborate. Judy” So please contact her via the means she mentions. Regards, S.
Thanks for the comment, Sylvia … I double-checked, however, and Gray Flora is listed on the Mississippi page. The information there confirms the information you have given me, thanks. I’ve also added his burial site. If you have anything further on him, would be very happy to share it. S.
My ancestor Gray Flora fought in the Civil War with the 3rd Battalion Miss. State Troops. He is buried in the Pinetucky Cemetery, Noxubee Co., MS. I noticed he was not listed. Thanks. Thanks for that …. I will post it up on the FB page as well …. never know when someone might turn up with more information on your line. It sounds interesting …. I’m so happy to connect with the Flora Family! I have been researching the Flora’s for several years and made several trips to Kentucky in search of information and just can’t seem to get beyond my 3rd great grandfather, Sanford Flora. He was born about 1830 in Harrison County, KY, I believe. He died in 1904 and is buried at Versailles Cemetery, Woodford County, KY. He married Elizabeth Ann Githens in 1855 in Nicholas County, KY. Their children were Millard, Edward (my ggf), Leonidas, John, Martha and Frank. If anyone could point me in the right direction, I would appreciate it so much!!! Thank you! My family is from Kentucky, over near Bowling Green in the West … but I have no Sandford in the line that I am aware of. Regards, Steve. Hi, Karen. I am just starting to research the Sanford Flora line, myself. My husband is descended through Frank’s line. My mother-in-law (Frank’s granddaughter) always said that for some reason, Sanford wasn’t raised by his parents but was “fostered” by another family. I can place him in the 1850 census but I have no records of him before this. I am even having trouble researching his wife. If you have found anything further on him (and you see this post) could you point me in the right direction, also? Thank you!! Sanford was born about 1835 in Harrison County, KY,. He died in 1904 and is buried at Versailles Cemetery, Woodford County, KY. He married Elizabeth Ann Githens in 1855 in Nicholas County, KY. Their children were Millard, Edward (my ggf), Leonidas, John, Martha(Mattie), Frank Morton, and John W. (B 15 Jan 1868, Blue Lick Springs, Nicholas County, KY. He married Nora Mehring, and he died 26 Sept 1942, Gallipolis, Ohio). I would be happy to send you copies of all the documents I have. I would love to have help figuring out who Sanford’s parents were! If you would like to email me, I can scan and send you the documents that I have. I will put that query up on the Facebook Page as well. Regards, S.
Daniel, I have created the initial “bare bones” of that page on the site now … it is simply entitle “Civil War (American)” and fits quite nicely on the top line of the page …. S.
Good morning, I’m emailing to ask for research help on the Florey-Ott-Stuart families. They migrated to Illinois from southwest Virginia around 1828. My husband descends from Sarah Jane Stuart Kessler (1828-1906), daughter of Robert Stuart and Catharine C. Florey, granddaughter of John Florey and Mary Ott. Sarah is also a younger sister of Julia Ann Stuart Wallace (1821-1912). Julia’s obituary is the best lead I have so far. According to the article, Julia, often, retold tales of her grandfather’s Revolutionary War adventures and also of the Stuart family life in early Illinois. Does anyone know if Julia’s stories where written down or transcribed? Does anyone know about John Florey in the Revolutionary War? Funeral services for Mrs. Jula A. Wallace, who died Sunday morning, will be held this morning at 11 o’clock in Mt. Zion, burial in Long Creek Cemetery. Mrs. Wallace was born in Wythe County, Virginia, September 8, 1821, and was 90 years and six months of age at the time of her death. She was one of the very oldest settlers of this part of the country, coming to Illinois with her parents, Mr. and Mrs. Robert Stuart, in November, 1829, and on account of the extremely deep snow all settlers who came to Illinois in that year were termed, “The Snowbirds”. They settled near the place known as the Old Trading House, which was northeast of where Decatur is now located. A few months later they moved to Macon County and some 82 years, or practically all her life, was spent in Macon County. told in her later years of these times. She was married to Robert Wallace January 23, 1845, who died May 16, 1904. Of the 59 years of their lives spent together, they lived more than 50 years on the old homestead eight miles east of Decatur. That is, east of where Decatur is now located, for in those primitive days Springfield was the nearest trading point of any moment. It was no unusual thing for Mr. Wallace to drive to Chicago for the sale of his stock and grain. Mrs. Wallace leaves four children–Mrs. J.P. Nicholson and Mrs. Sarah E. Bryant of Decatur, Mrs. Lewis Myers of Mt. Zion and Mrs. M.D. Kizer of Dallas, Texas. Besides these four children who survive her she had one son and two daughters deceased. She had a remarkable line of descendants, the majority of whom are still living, there having been seven children, twenty-eight grandchildren, twenty-six great grandchildren and one great great grandchild. Decatur Review, Tues., March 19, 1912. Fact 1*Buried on March 19, 1912 in Point Pleasant Cem., Macon Co., IL. Birth*Julia Ann Stuart was born on 8 Sep 1821 at Wythe Co., VA . She was the daughter of Robert Stuart and Catharine C. Florey . Marriage*Julia Ann Stuart married Robert Wallace on 23 Jan 1845 at Long Creek Twp., Macon Co., IL . Death*Julia Ann Stuart died on 17 Mar 1912 at Mt. Zion, Macon Co., IL , at age 90. Laura, Just checking my database here …. your Catherine C. Florey was the fourth child of John Florey’s (1760-1850) second marriage to Mary Ott … I am related to George Flora, the first child of John Florey’s first marriage to Elizabeth Breidinger (they had four children … George, Elizabeth, John and Adam). John Florey’s second marriage resulted in it would seem 21 children (Mary, Sarah, Henry, Catherine C., Cynthia, Eleanor, David, Mary “Polly”, Matilda, Emily Amy, Jonathan, Mary Ann, Fred, Israel, ?, Andrew Jackson, Rhoda, Cyrena, Jack Ed, Isaac and Virginia A. Whew!). In about 1818 or 1819, George and Adam left Wythe County, Virginia and travelled to the Western Kentucky tri-county area which later became the counties of Warren, Barren and Edmonson (and where by the 1860s they were spelling their surname as “Flora”). I seem to recall that a group of families from the Wythe County area of Southwestern Virginia all migrated to that same area of Kentucky at about the same time. I have run across no evidence that George and Adam had any further contact with other family left in Virginia. Then, most of the other Wythe County Florey’s seem to have migrated to Illinois from Wythe County between about 1828 and 1831. By the time I started doing family research in the 1970s, the only recollections my grandfather (Jiles Rumsey Flora … who died in 1972) could recall was that the two brothers, Adam and George, had come from Virginia. He knew nothing further. In fact, he thought that we were descended from Adam, when it was later uncovered that we descended through George. I, myself, would love to run across anything further regarding the Revolutionary War service of either John Florey or his father, Nicholas Adolph Flohri (1734-1819). I just have a statement that, John Florey between 1775-1783 “fought in the American Revolution in Lancaster Co. PA” …. as did Nicholas Adolph Flohri I believe. “On 11 Feb 1815 at Wythe Court House, Wytheville, Virginia it appears that though John Flora was entered on the Roll for the 35th Regiment (Kent’s) Virginia Militia on 11 Feb 1815 through 4 March 1815, that he “Never joined”as is noted on the record”. Of, course by February 1815 the Battle of New Orleans in Louisiana had already taken place between the Americans under Andrew Jackson and the British Expeditionary Force … so the war was winding down. This information, by the way, is from the National Archives in Washington, DC, and its collection of the War of 1812 records …. Card Numbers 38808895 and 38809034. Bill Lucas has this comment about the F/F/F ancestor he is looking to find out more about. “In Bunderman’s book he is described as Nickel Mine John, son of Abraham, GS of Joseph and GGS of Joseph. According to Bunderman’s book, John worked in the nickel mines in Lancaster county but I haven’t been able to dig up anything further on the mines.” Anyone have any information on the mines in Lancaster County or on “Nickel Mine John” in particular? Recently received the following email on the F/F/F Rootsweb Server … can anyone help Rebecca? I am wondering if anyone in the group has a copy of the will of Jacob Flora that they would be willing to share with me. Thank you. Thought for a new Page on this site ….. I am thinking that it would be a good idea to have a page on which could be shared stories, pictures, data, etc. regarding F/F/F’s who were involved in the US Civil War of 1861 to 1865. I have a direct ancestor that was, and I am sure many others have one as well. Hello. Id like to Ask if I could Contribute Some history to the Flora Website, For many years I have been working on the Flora Contribution During the Civil War. and we have a good amount of information. Yes, most certainly … I will create a new page entitled something like Records, Recollections and Histories of the American Civil War … and there we can upload all sorts of Civil War Related material that connect in some way or other to F/F/F people. Tell me what you have in mind. (I have some information regarding an ancestor of mine in it in Kentucky for example) … S.